STAY AND PLAY! GUESTS AT TREWOON ARE ENTITLED TO DISCOUNTED GREEN FEES OF JUST £28 FROM 1ST APRIL TO 31ST OCTOBER 2018 AT MULLION GOLF CLUB! Trewoon is situated in a spectacular front line position directly overlooking the cove and picturesque sandy beach at Poldhu Cove. Nestled in the grounds of Trewoon are three cottages; The Chocolate Box, Rest-a-Shore (Property No. 50) and By the Seashore (Property No. 53). The grounds at Trewoon extend to some two and a half acres and run down to the cove, access to the beach can be obtained via a private gate. The rear boundary of Trewoon runs adjacent to Mullion Golf Course, the most southerly golf course in the United Kingdom. 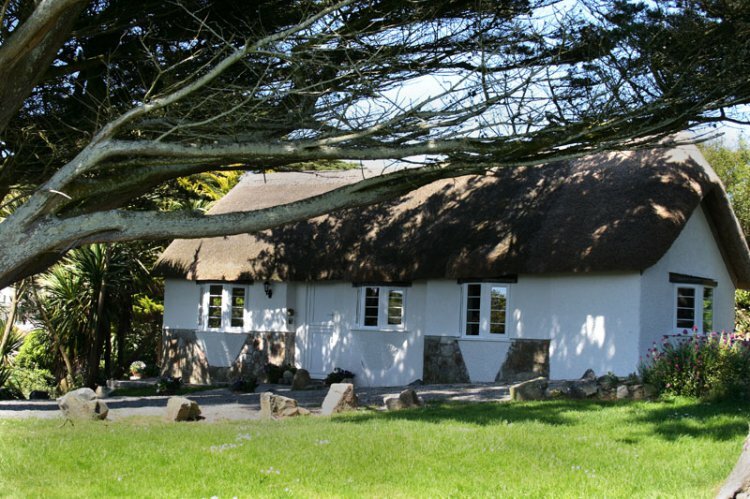 'The Chocolate Box' is a cosy thatched gatehouse which is situated directly overlooking Poldhu Cove. It offers a very high standard of accommodation and furnishings yet retains all the charms of a period thatched cottage with cast iron radiators, exposed beamed ceilings and real wood floors and doors. The cottage is sheltered by ancient pine and palm trees and enjoying its own lawned area and large patio from which beautiful views of Poldhu Cove and the grounds can be enjoyed. The left of The Chocolate Box's garden is edged by a series of linked fishponds and to the rear by a Cornish hedge. From the garden golfers can be seen teeing off on the seventeenth hole of Mullion Golf Course. Opposite the cottage is a large secluded grassed area beneath the trees available to the residents of The Chocolate Box. This centrally heated and double-glazed detached cottage comprises of a well furnished lounge with an exposed beamed ceiling, has two armchairs, coffee table, LCD TV/DVD combi with freeview. Wi-fi is available in the cottage. The lounge enjoys a beautiful view of the cove and gardens through French doors. The well fitted solid oak and granite kitchen with partially beamed ceiling, stable door and views of the Cove and gardens includes an oak dining table and chairs, an electric range cooker, Smeg fridge with ice making compartment, cafetiere and microwave. There is a small utility room which has a washing machine and tumble dryer. The extended bedroom with exposed beamed ceiling has an oak king-size bed, bedside cabinets, clock/radio CD player, dressing table and bookcase and enjoys views of the gardens. There is a small separate dressing area with wardrobe off the bedroom. The extended shower room is fully tiled and has a large shower cubicle with electric shower, handbasin, toilet and heated chrome towel rail. NB ALL PILLOWS ARE FEATHER. PLEASE NOTIFY AT TIME OF BOOKING IF MICROFIBRE ARE REQUIRED. Linen will be provided with freshly made up beds and a welcome tray will be awaiting your arrival. A selection of books and games is provided and the central heating and hot water are controllable by the guests. Private garden. A private conference room is also available free of charge by arrangement with the owners. Rental includes bedlinen, electricity and central heating. The owners regret that there are no children under 12 years of age allowed and no smoking inside this property please. DOGS: The Chocolate Box is suitable only for one large dog or 2 small dogs. Please check with us before booking if in doubt. Dogs are charged at £40 per dog per week. Click in the 'Video' tab above to see a time-lapse video of a day in the life of Poldhu beach as seen from here at Trewoon. If you are looking to book Christmas or New Year, please contact us before booking. This property is available all year round but is extremely popular. Consider booking at least 12 months in advance. Thank you. Need to check your mobile reception? Coverage in many parts of Cornwall can be spotty. You may want to check the reception at this property before booking. Please note that signal maps can be a bit optimistic at times, we cannot be held responsible for the accuracy of mobile coverage information. It is your responsibility to ensure that you have the required level of connectivity before booking. Please contact us for more information. Property specific pet notes: Please note, this property will accept 1 large dog or 2 small dogs. Please call if unsure. You can select these optional extras when placing your booking, some will incur an additional charge as indicated below. The Chocolate Box is part of the Trewoon family of cottages, the other cottages are displayed below. Copyright © Cornish Cottages Ltd 2019 - All rights reserved.